The third project that we’re fundraising for here at the Europe Centre Summer Course, as well as our own and the Israeli Retreat centre, is the Caracas Buddhist Centre. While the outer conditions in Venezuela are truly unlivable, and her citizens enjoy the unplanned consequences of the planned economy, including severe shortages of basic goods, rampant theft and gun crime, the members and visitors of the Caracas Buddhist centre are concentrating on inner values. 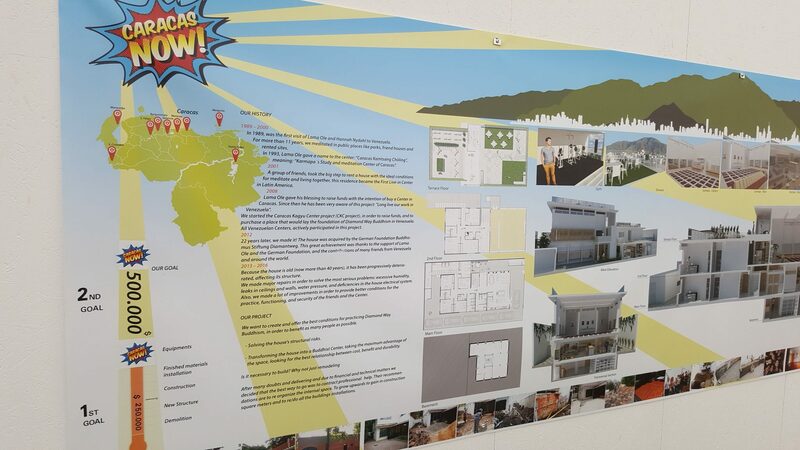 To properly serve the ever-growing numbers of Buddhist practitioners, they have come up with a grand plan for a complete overhaul of their centre. Construction costs, like most costs in Caracas, are prohibitive, so international donations from fellow Buddhists are really the only chance for the project to succeed. Since the main teacher of Diamond Way Buddhism, Lama Ole Nydahl, chose this project to be promoted, he must see the outer troubles to be temporary and the investment in inner development as lasting and worthwhile. The Venezuelans have been an enthusiastic force here, fundraising with a different idea each day. Their haircuts have proven very successful.